This is an ‘evergreen’, timeless update from the Sophia’s Children archives. Is there a deeper purpose and beauty in relationship than what we might have been conditioned to see? A deeper beauty and richness of possibility that has been obscured by both fear-based conditioning as well as the loss of wisdom that some of our ancestors knew well? An opportunity to become more and more aware of what we “invite out” as well as “project and reflect out” from one another in intimate and various other relationships? As ever, when we travel back to ancient times, we may find a clue about very timely and helpful understandings and wisdom that’s been lost (or buried) between then and now. What we may know of Aphrodite-Venus — one of the many faces and facets and names for the Divine Feminine — is that she was revered by the Greeks and Romans (and others, by other names) as the Goddess of Love and Beauty. In more recent times this has taken on a kind of greeting-card quality, where love or relationship floats along the surfaces of the romantic fantasy, all rose-colored lenses, chocolates and flowers. And that’s lovely enough. Yet when I found myself in the grips of a radically transformative Pluto & Pals cycle, where relationships like everything else went topsy turvy — and not in good ways — this Goddess of Love and Beauty image seemed a distant possibility. 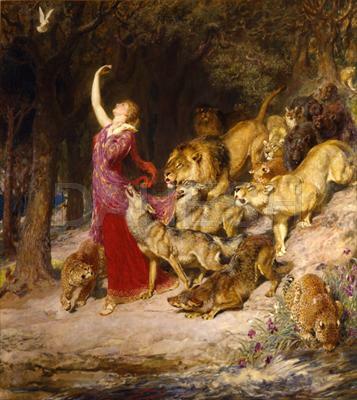 Aphrodite, 1902, by Briton Rivière (1840-1920). … that of Dark Goddess of transformation, and champion of all that’s been banished, exiled, marginalized, and suppressed. In those times, the Dark Goddess was known and understood as the initiatrix as well as creatrix. Maybe they’re one and the same roles – through initiation, a creative process takes place, and something far richer is born from those depths. But over so many millennia, we lost this awareness. For Dark Aphrodite, her role as initiator didn’t take place in the deep crypts of the temple, but in relationship itself. Relationship was her cauldron of transformation and creation, as it so often is (if we’re awake to that). This speaks to an awareness that’s been growing and ripening in me since transiting Pluto transited my 8th house natal Venus around the 2005-2009. By that point, Pluto (and Pals) had already squared or opposed various self-facets and the correlating areas of Life shown in the Mutable Cross of my natal chart (hint, that’d be more than 6 planets, including Chiron). For the non-astrologically minded, that’s a lot of Pluto, not to mention Pluto’s Pals, Saturn, Uranus, and Neptune doing their thing at the same time. I was, inescapably (as is the case with Pluto transits), in Dark Aphrodite’s cauldron of transformative relationship. 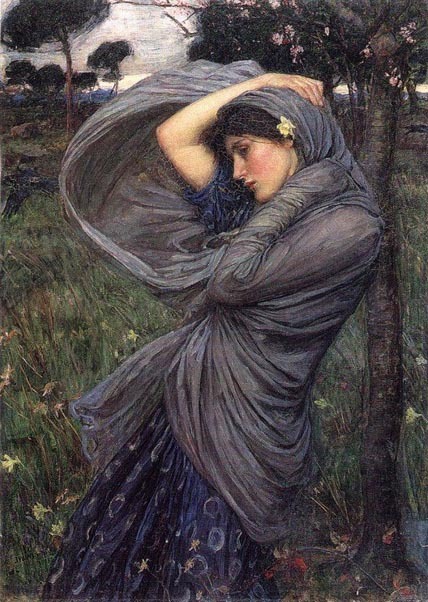 Boreas, by John William Waterhouse (1903), Image courtesy of WikiCommons. Whether I liked it or not, the bubbling cauldron was birthing a deeper appreciation of the beauty and power of relationship itself that seems so different from the chocolate-and-flowers romantic version (not that these things can’t be a part of it, thankfully!). Or, (2) given the unfortunate increase in expectations of instant gratification, we quickly dismiss the relationship as flawed the second a challenge arises that threatens the romantic fantasy we’ve been fed in books and movies, or, goddess forbid, threatens to shake some conditioning out of us! Usually, those frustrations get projected out onto others — it’s ‘their fault’ — and our reaction is to fuel drama, blame, or run. Common enough, and sometimes those insights or projections are spot-on accurate and true. At other times, the projections are more reflections of old and unhealthy conditioning and patterns coming up for healing, refining, releasing, or transforming. What if, though, something truly sacred happens when we come together with another person in relationship? Sobonfu Somé shares her Dagara tradition that, just as each person has a purpose and spirit, so to does a relationship. In fact, in her tradition, this third spirit — what I ended up calling the Spirit of the Relationship — brings together something altogether more powerful than either individual offers alone, magnifying the individual’s purpose and resulting in a great gift to the community when cultivated and shared. Through the relationship challenges that arose during the Pluto & Pals cycle, and all that got churned up from my own depths, I knew intuitively that something richer, some deeper awareness, was trying to be born, even as I had no specific understanding of what that was. 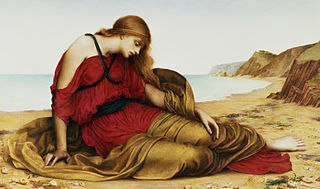 Ariadne in Naxos, 1877, by Evelyn De Morgan. Rather than running for the hills — though the toxic relationships ultimately ended, and at no time was I in immediate physical danger (a whole different issue) — I was guided to cultivate the riches in the depths (a ‘project’ that wouldn’t have been possible without the wisdom and love of my inner-circle of trusted friends!). Many ancestral/indigenous and mature spiritual traditions put the responsibility squarely in our own laps: What comes up in our experience reflects something that’s within us, individually or culturally. But rather, we can see it as an opportunity to reclaim responsibility (response-ability) for what may be arising within our own selves and what the external experience was reflecting to us — and, as appropriate, entering into reflection and discernment about how we find ourselves in such patterns of relationship … where did such a “toxic normal” begin for us? 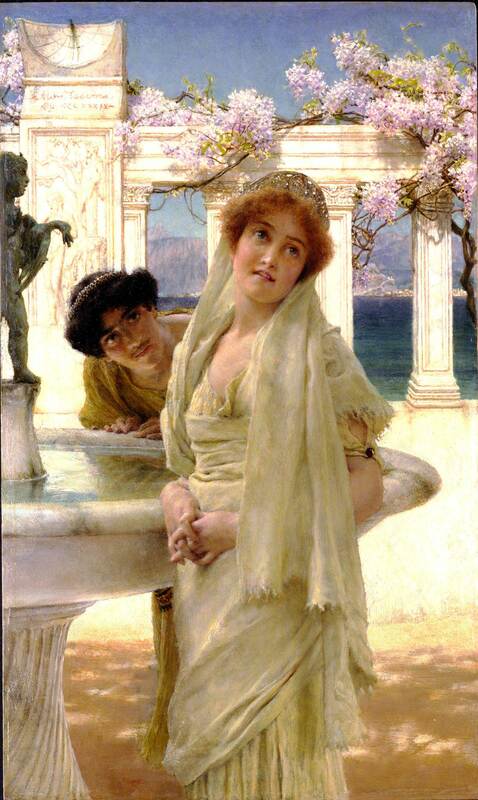 A Difference of Opinion, 1896, by Sir Lawrence Alma-Tadema. When such ‘trigger‘ experiences arose (or arise), I was prompted to ask “What is it within me that’s bringing this up into my experience?” and/or “What old stories and patterns are woven through my consciousness and energy field and reflected through this experience?” among other transformative inquiry kinds of questions. Sounds like a drag, and often it felt like just that, yet there’s often a beauty wanting to be born, or some long-ago abandoned quality of being wanting to be remembered and revived, from seemingly unimpressive raw materials. It’s important and even vital to make the distinction, since many religious, spiritual, and even secular traditions and conditioning can seem to encourage staying in abusive relationships. Assuming healthy rather than abusive relationships, we know that any enduring relationship traverses its rough spots that challenge us to the core. If we can approach these mindfully and mutually, with shared commitment to the Spirit of the Relationship and each other’s wellbeing, we may well unearth gems of unimaginable beauty that are hidden in the depths, available only to those who persevere with the Spirit of Relationship in mind. 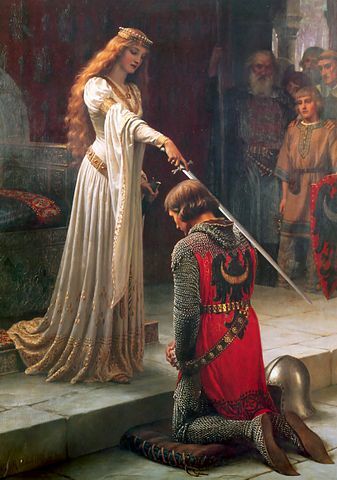 The Accolade, 1901, by Edmund Blair Leighton. 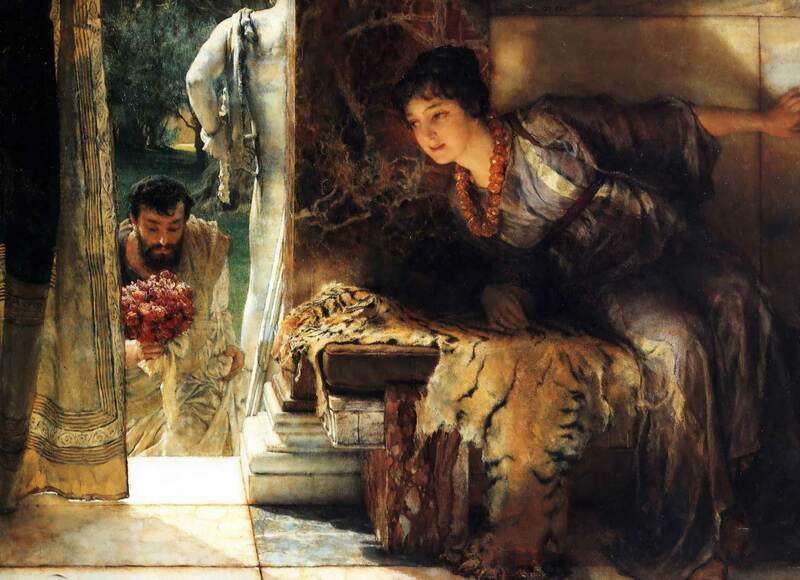 This circles back to the ancient, timeless Mysteries and the initiations via Aphrodite-Venus as she who initiates us through the cauldron of relationship, where those baser raw materials within us — and within the relationship — can be used to create something beautiful. Coming together with another person, whether in the form of intimate partnership, friendship, or even in the workplace, may offer both the initiating and creative possibility. Relationship, recognized this way, becomes sacred and purposeful, an opportunity not just to liberate the beauty within us and the relationship itself, but to free and express the gifts of the spirit of the relationship — a gift that blesses the community and might not otherwise be born and expressed. How different would it be if we saw relationship this way, if we looked at our partner, our friends, our workmates, and saw a canvas awaiting our artistry — base metals and raw materials wanting to be shaped into something beautiful? How Can You Help Support the Work? 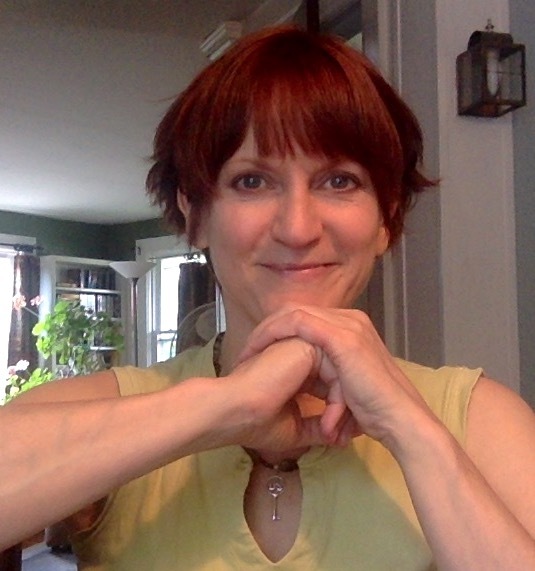 If you’ve found regular inspiration … or a super-handy dose of it … in this and other Sophia’s Children articles and offerings, consider supporting the work with a gift. Even wee amounts add up to a big help in keeping the labor of Love flowing. Labyrinth image credit: Green labyrinth in Luxembourg City. PD image from Lode Van de Velde, PDpictures.net. Bravo! I have been in this space with someone for a over a year, now & can honestly say that sometimes I feel something of that archetype you described of the early Aphrodite present in quiet moments of reflection & deep intuitive choice. I take myself to task when something demands my attention now, asking myself what it is in myself that needs to be addressed/healed/released & feel a more empowering intimacy growing from within me. Thank you for this beautiful , timely post. May I ask if Dark Aphrodite and Kali share similar facets as a Goddess (seemingly) predisposed to inciting or bringing about transformation, whether that be through assimilation, absorption and mutual sharing of her affirming qualities, or via the destruction, dislocation, or diminishing of the ego so as to permit Love to flow unencumbered into our soul without hesitation, thought, doubt, fear or trepidation? Thanks again Jamie, another lantern lit and hung for the questing traveller to follow. Greetings, Dewin. I hope you’re very well. 🙂 Thank you for visiting, and for your thoughtful inquiry/musing … an interesting question. From one perspective, Dark Aphrodite speaks to the transformative cauldron of relationship … relationship as ‘guru’, if you will, whether conscious of it or not. Kali may be similar, or Vajrayogini / Vajravārāhī, etc. 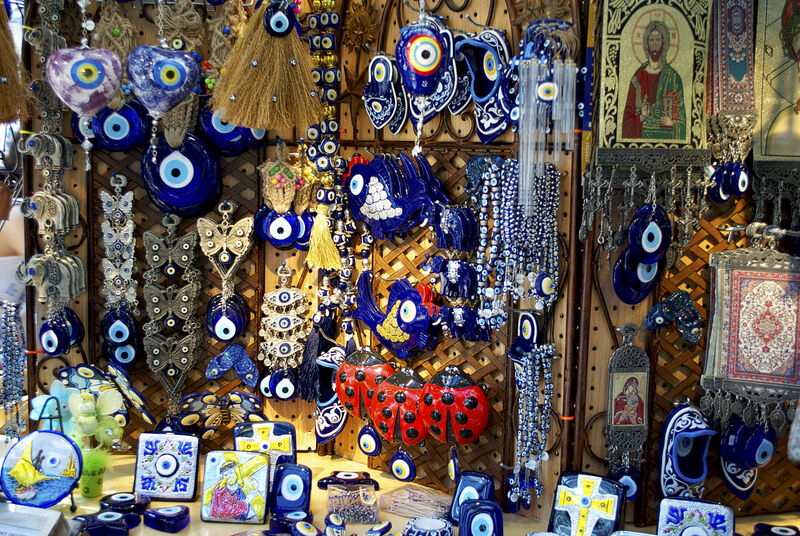 Perhaps the same Essence being known by different names in different cultures and times. Perhaps an ‘and/both’ … these transformative-cauldron facets, among others that cut through the conditioning, conditioned mind, ego, etc. I appreciate that bit from Eckhart Tolle … I enjoy his dry, wry wit when speaking of such things. 🙂 And yes, his reminder and your addition seem very apt, from my perspective and experience — engaging with that consciously is not for the faint of heart (but then it’s not all that pleasant being in the round-and-round of unconscious dysfunctional relationshiop, is it? :). I think one could readily take the phrase intimate relationship and permit its specific use in defining the approach of the artist, the writer, the poet, or any other creative individual who is inspired by beauty and aspires to truth. Intimacy is centred at the very heart of this creative relationship and found in the act of making art itself. I imagine the ‘spirit of this relationship’ (the combined presence of Dark Aphrodite, Aphrodite and Venus) to then be the transformative agents driving expression itself towards purity and simplicity and taking the creative along with it? And at the heart of all that in equal proportion simply has to be Love. Have a great week! Take great care.